An important new report by Medical Justice, ‘A Secret Punishment’ – the misuse of segregation in immigration detention, highlights the human damage caused by the use of segregation in immigration detention, as well as its political purposes. Arriving at Heathrow Airport in 2011 on a family reunion visa, 24-year-old ‘MD’ expected to be reunited with her husband – a refugee whom she had not seen in three years. Instead, she was questioned by an immigration officer and, after becoming confused by the questions, subsequently detained in Yarl’s Wood immigration removal centre. She did not leave until nearly a year-and-a-half later, by which time her mental health had deteriorated to such an extent that she was deemed to be ‘lacking capacity’ under the Mental Health Act. In detention she had sliced open her forehead with the top of a sardine tin, cut her face and stomach with broken pieces of china and attempted to strangle herself with a telephone cable. She self-harmed at least eleven times between August and November 2011, the response to which was to handcuff her, restrain her and remove her from association with other detainees. The High Court later ruled that what she been though amounted to ‘inhuman and degrading treatment’ under Article 3 of the European Convention of Human Rights, which also covers torture. 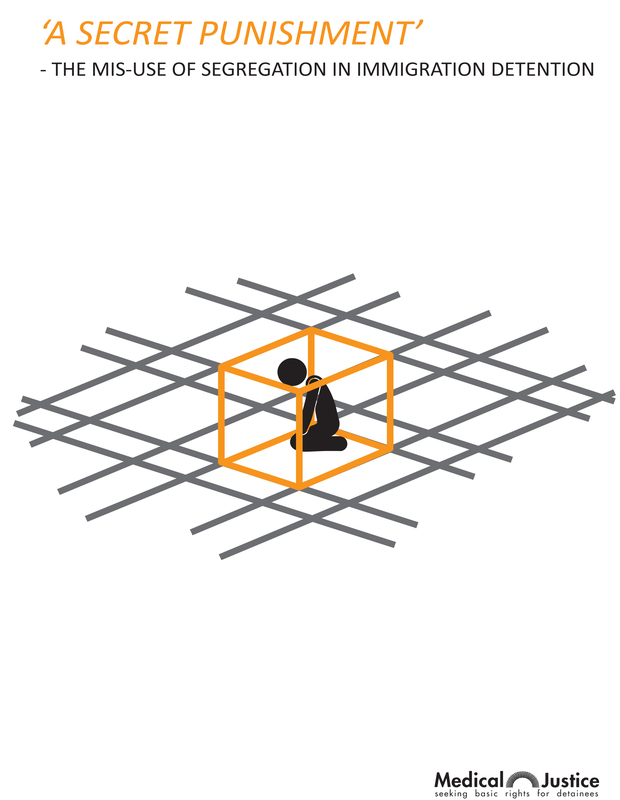 That segregation – the isolation of an individual for up to 23 hours a day – can amount to torture is now established. It is a ‘secret punishment’ according to Medical Justice. Their report documents the scale of damage caused by segregation by examining their own casework with people who are or have been detained. It also draws on what little external scrutiny exists – most notably the inspection reports from HM Inspector of Prisons (HMIP) and the annual reports of the Independent Monitoring Boards (IMB). ‘Relatively short periods of segregation’, the report says, can lead to ‘social withdrawal, perceptual disorders, hallucinations and suicidal thoughts’. But segregation is not only carried out for short periods. In one case documented in the report a person was held in segregation almost continuously for twenty-two months. In another a person was taken to a psychiatric hospital after eighty days of segregation. ‘The mental health of individuals is frequently allowed to deteriorate to the point where they require sectioning in a secure psychiatric facility under the Mental Health Act’, the report states. Some 30,000 people are detained in immigration removal centres each year in the UK, and between 1,200 to 4,800 of those are segregated. This setting appears to encourage institutional contempt for outside scrutiny. But the use of segregation, integral to the functioning of the system, is barely acknowledged and shrouded from view. As A Secret Punishment explains, segregation is frequently used as a form of control, to ‘manage’ the detainee population. It is deployed in different circumstances to ensure specific forms of social order. Home Office policy stipulates that it may be used in the ‘interests of safety or security’, the report notes. In practice this means that it is used as punishment, an ‘unofficial sanction’ for ‘non-compliance’. Detainees who are described as potentially ‘disruptive’ can be isolated in areas with ‘limited regimes’: limited access to the internet, fax machines and contact with lawyers or supporters. In some cases, the person’s mobile phone is removed, and segregation is a means through which to ensure that his or her removal can take place – unhindered, and without accountability. Described by IMB reports as ‘bleak’, ‘depressing’, ‘austere’ and ‘bare’, the cells used for segregation are no place for those who are vulnerable. Yet it is the most vulnerable detainees who are frequently placed in them. Such is the extent to which they are used to contain those with suicidal thoughts, the report notes, that in one immigration removal centre detainees have taken to hiding their concerns, through fear that they will end up in ‘the block’: a regime – compounding fear and desperation – that is used to warehouse the most vulnerable. Brian Dalrymple, a schizophrenic American tourist with severe hypertension, detained in 2011, was placed in segregation on numerous occasions as a way to ‘manage’ his deteriorating mental health. He died of a ruptured aorta, alone and isolated in a single cell, waiting for a psychiatric assessment. A Secret Punishment provides evidence of the strategic use of segregation in immigration detention. What little accountability there is for a decision to segregate a detainee can be circumvented by a parallel, de facto form of segregation, described euphemistically by those managing detention centres as a form of ‘care’. ‘These regimes’, the report states, ‘are sometimes referred to as Care and Support Units, Induction Units, Assessment and Integration Units or they may be part of in-patient healthcare facilities’. They include – or have included – the Eden Wing in Brook House; the Bunting Unit at Yarl’s Wood; the Rose Unit at Colnbrook. ‘The main concern with de facto segregation’, it continues, is that those held under such regimes ‘are not subject to the paperwork and safeguards that go along with segregation under Rule 40 and Rule 42 – with requirements for daily checks and behavioural observations as well as justifications for continued segregation.’ These units are ‘grey areas’, the report explains. Citing HMIP reports, it shows how, for example, the Bunting Unit has previously been used to hold ‘disruptive’ detainees under the terms of an ‘unofficial, but among staff widely acknowledged, policy’. The Assessment and Integration Unit at Colnbrook has been described as a ‘bleak’ place where ‘rooms contained no furniture beyond a mattress on a tiled concrete plinth, and a concrete toilet without a seat’. Some of these de facto segregation units have been disbanded. Some have been rebranded. Several are described by the centres themselves as places for vulnerable people. That this is the case gives an indication of the extent to which language is perverted, and meaning twisted, in immigration detention. Regardless of how they are spun, A Secret Punishment makes clear that ‘the conditions of detention, including segregation, are so detrimental to the health and wellbeing of those detained that the only way to remedy this situation is to close IRCs’. Download a copy of the report, A secret punishment – the mis-use of segregation in immigration detention, here. The large disparity in numbers, the report notes, is due to ‘a four-fold discrepancy in rates provided by Home Office and those reported by HMIP’. And what this have to do with finland?